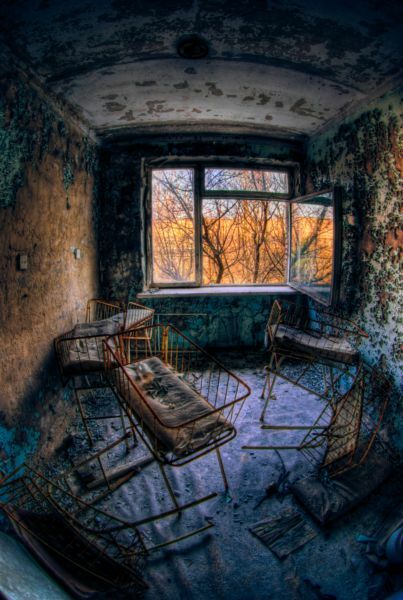 Photograph of the department for newborn children, Pripyat’s hospital, Chernobyl alienation Zone, Ukraine, by Sergii Shchelkunov. Next Post →Sight Gag: "Making the World Safe …"
Absolutely amazing photograph, congratulations and well done! What I first noticed about this picture is how it’s viewed through a somewhat seems like lens. It also looks as if there was a earthquake happening and they sort of just left the hospital as is. This photograph captured my eye and is very unique. A stark emptiness of a nursery with cribs thrown astray creates a horrendous unease for the viewer. This nuclear meltdown in Chernobyl epitomize us that death, illness, and sheer panic from a catastrophe like this is indeed man made. Power, electricity are modern commodities we all wish to make and hold onto. This disaster stems from the world race to stay and be a part of the technological advances at all costs. Thinking about the people displaced and left wondering if their health will be negatively affected, or if their sons/daughters will at some point die of cancer makes me feel that this disastrous event has not received sufficient public awareness. I commend the photographer, and the committee that choose this picture as the Sony World Picture of the Year. Too soon do we overlook the past and tragic proceedings that could happen to any nation today. This is one of the most interesting photos I have seen in a long time. I think that this image delivers a strong message about warfare in way that is appealing to all viewers. This image is clearly showing the devastating destruction of warfare with the empty, torn apart cribs that lead the eye towards the window revealing the dry, dead looking limbs of the trees outside. Even though the content of the image is shocking and disturbing, the colors are bright and attractive making it an easy image to view. This image offers a hand to those who may be conservative, faint of heart, or even a bit squeamish to experience the destruction of warfare.